Product #18670 | SKU RODSVMX | 0.0 (no ratings yet) Thanks for your rating! The VideoMic features digital switching on the rear that allows the user to control level adjustment, high-pass filter, and high-frequency boost to increase intelligibility of dialogue. 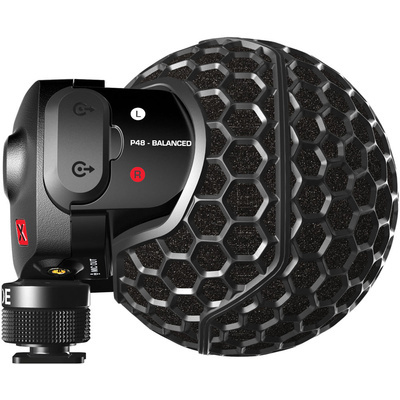 The enclosure is constructed of a lightweight aluminium, and, inside the enclosure, the capsules are supported by the Rycote Lyre shock-mounting system, providing isolation from vibration as well as knocks and bumps. In addition, a pop shield and wind shield is included.